...Pine would be a rather odd name for a little Pigeon. How about we name him after you? I was thinking that yesterday, when I saw your name. Manuel would be perfect. Update: Manuel is with Lucky now. He is doing ok. He is very quiet but I can see the strong will to survive. His head is in very bad shape, although it is getting better. I am not sure he can see even when he is able to open one eye and I am not sure he can hear either. I will do my best to take care of him until Saturday when he'll see the doctor. I have contacted Environment Canada. I was told pigeons are the jurisdiction of the province. I was given a few numbers but none of them take pigeons. There is no pigeon rehabilitation centre/service in Quebec however the laws regarding caring for pigeons are very strict. I am planning on getting the word out about this, find some support and propose solutions. One solution which has worked out in other parts of the world is "safe feeding zone" for pigeons (this applies to big cities like Montreal). These zones will be protected and away from busy city streets and buildings; there would be structures put up (lofts/aviaries) where the birds would be able to eat and nest. There would be designated people who would feed the pigeons regularly and replace their eggs in the winter. This would ensure that the birds do not breed in the winter, they are fed, they don't jump in front of cars for food, they don't freeze etc. Any Canadian support (especially Quebec) would be great. Thank you to everyone, you are all very special people! We will do all we can to support you. I know there are Pigeon people in Montreal because kind people that love/care/appreciate Pigeons are everywhere. It's just finding them. 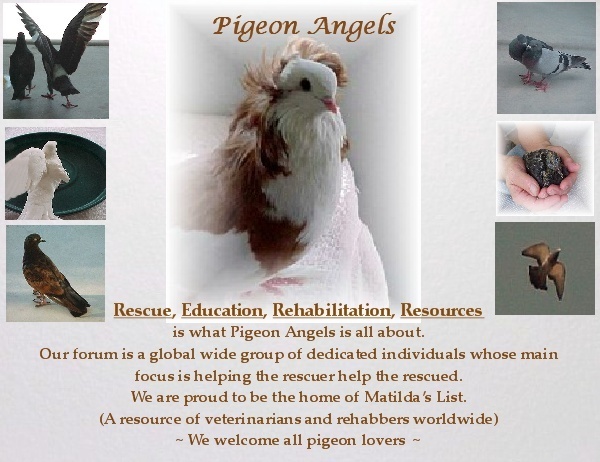 I would suggest calling veterinary clinics and ask if they have a private rehabber they refer injured Pigeons. Go though all you can. If they say no and if they know who might know of a private rehabber. Eventually, you will find other caring people. Thank you so much for the update on Manuel. We greatly appreciate it. We will be eager to hear how the vet visit goes. Sending positive thoughts. WOW Matilda, that's a great solution! Hope the vet visit goes fine. Manuel has such a strong will to survive...praying that the poor baby is on the road to recovery soon. Thank you Irina for caring for him, I am sure you will be able to work out a solution in his best interests. Looking forward to updates about him. Will have Manuel in my prayers. Manuel the rescuer prefers that I do not take the birdie to the vet, he would rather wait until Saturday when we get to the hospital. The birdie is looking ok, he is eating (not on his own though) and pooping. I called the hospital to ensure they would take all 4 birds, they said they will take them but if they are not releasable they will have to be put down. I asked if they could call before doing that because we can just take them back, but, by law, they cannot give the birds back once they are in the hospital. In the meantime I am trying to educate myself as far as the laws in this province and the services provided. What a difficult situation for little Manuel. let me ask you this...is there a vet that would look at the injuries with out confisicating him? If so. Can you keep him through recovery if we can raise the moey for medical evaluation? I do fear he will be put down otherwise just because he looks so bad. You have done so much and I don't want to aske of you something that is beyond your comfort level. Any decision on your part will be totally supported by me and I want you to know that. There is a vet Amal used; he will not confiscate the bird and he will help us. I will gladly go (I wanted to go this morning...) and I will definitely need and appreciate your support, but the issue is that it is illegal to keep pigeons in private homes here in Quebec. If I want to make any sort of difference for pigeons in the long run, breaking the law is not the best place to start. If the authorities find out, they will fine me and destroy all the birds in my care too. What should I do? I obviously want him to live, I will take him and do my best...but what about what his rescuer wants? What will happen once Manuel is recovered and human imprinted? And what if he never flies again? I don't understand why the government is asking us to be inhumane. They are taking away my most basic right. I am waiting for a response from Environment Canada; I have also contacted PETA. Let me send you a band for Manuel...your fancy pet Pigeon. Should need be, the band can be removed as it easily snaps off but in the meantime, he is a pet Pigeon. I can get it in the mail Friday morning if you email me your address. Would love to have the vet's contact info for our resources. I will send you my address, thank you. But what exactly does the band do? Can you give me more info? The band is something many people put on Pigeons that are domestic or pets. Feral Pigeons don't have bands. After tomorrow, I will help you wil research. Send me your address. OMG that's so terrible It would be heartbreaking to see Manuel being put down Keeping fingers crossed that between Irene and Charis, they reach a solution which doesn't involve handing over Manuel to the hospital and somehow he can be kept as a pet. Manuel's appetite is back and he had a lot of peas tonight (two feedings of 50 pieces each). He would have had some corn too, but they are Lucky's favorite :) so he didn't get many of those. He is going to a vet tomorrow; fingers crossed he'll be fine. I'm so happy Manuel is eating. I hope the Vet visit goes well. I have my toes and fingers crossed that everything works out fine. LovelyFlight-I like your screen name! Thank you Birdbarn; Lovely Fight is the title of one of my favourite sound tracks. I really like the music. It has a great beat for cleaning house. Thank you! I took that picture right before we met Pepere and Amal; I thought it was my last day with Lucky. I have no chance for normal hair in this house...my head is being used as a nest most of the time. He will stay home tomorrow while I take Lucky and Palomita to the Ottawa hospital. Certainly,you are welcome to information we have gathered here in anyway it will help the cause. That's good new about Manuel. When will he have surgery? That is one fortunate Pigeon. Take lots of pictures please so we can do a YouTube video of his story and recovery. I'm partnering with Northwest Children's Theater in the Spring for the world premere of...Don't let the Pigeon Drive the Bus. They have asked us to promote Pigeons and this site. They would like to have positive Pigeon story videos playing in the loby before show times and during intermission. Maunel's story would be perfect.